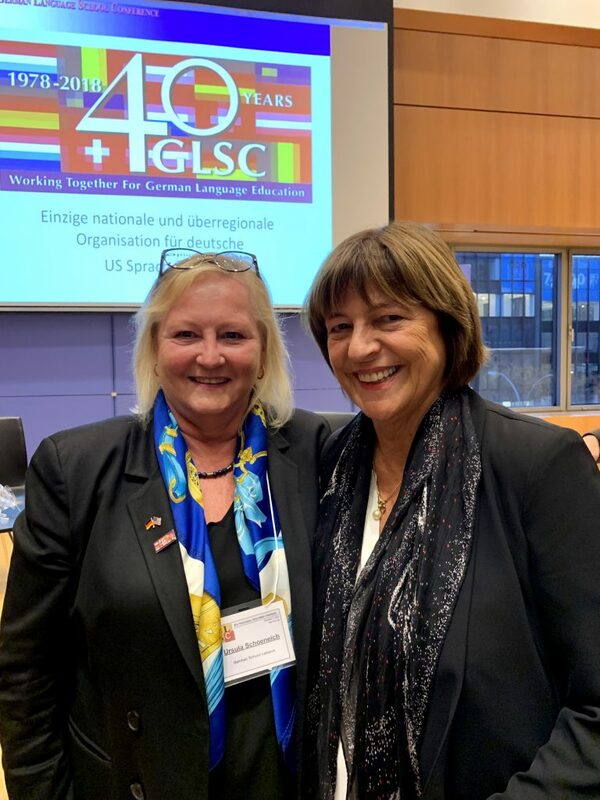 School President of the German School Campus, Mrs. Ursula Schoeneich flew to New York to attend the 40th anniversary of the GLSC (German Language School Conference). 162 teachers, students, principals, school boards, speakers, sponsors and guests of the German language schools met for the 38th GLSC Education Conference. Numerous participants from the US states, Toronto, Bremen and Berlin were present. As every year the conference started in the early morning hours in the German House at the UN Plaza. Over coffee and pastries, the first book displays of the sponsors could be visited. Anna Garrido from the Cultural Department of the German Consulate General New York welcomed the attendees and President of GLSC Dr. Renate Ludanyi gave a short speech and honored members. To the surprise of the students and the audience, gifts were presented to them by an international youth star. The 15-year-old Malina Weissman is a German-American model and meanwhile also a well-known actress. She used to be a student at the German language school in New York. A wide range of workshops for teaching students of different ages about STEM, curriculum design, exam-relevant questions, studying language students in Germany as well as presentations in the administrative area ensured a varied workshop day. In the afternoon, the conference reached its highlight with the visit of Ulla Schmidt, member of the Bundestag and of the Subcommittee on Foreign Cultural and Educational Policy in Berlin, Germany. Following her presentation on the role of language schools in the USA, she answered questions from participants on a wide range of topics such as the importance of the German Language Diploma in the USA, the financing of language schools and the consideration of pre-school and kindergarten children in school development. Mrs. Schmidt encouraged the language schools in their work and wished the GLSC many more successful years. Following the conference program, the German Consulate General New York invited all participants and guests to a reception.